Art = Life at R.L. 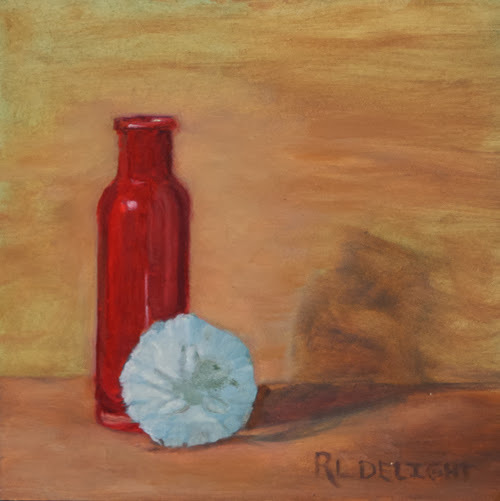 Delight Fine Art: 30 in 30 Challenge 2014-Day 1: Happy New Year! This painting is available! Please click here to go to the 30 in 30 challenge auction. Starting bid at $25. Happy New Year! The year is starting beautifully here on the Northern Oregon Coast. January is going to be a very busy month for me. As you can see, I have decided to put all the 30 in 30 challenge paintings on auction with a starting bid of $25. All of these subjects are still life. I might throw the occasional plein air coastal-scape painting in too. As I have mentioned before, I like to paint from life, oil studies, or my imagination. I remember it was a struggle for me to do that last year when the weather wasn't cooperative. I had a bit of a distraction today in the form of a baby fur seal. I helped ward it from curious onlookers until the aquarium people could assess the pup and put up signs. The pup made it safely back into that water at sunset. This shot was taken with a telephoto lens while the pup was being assessed for injury or sickness. 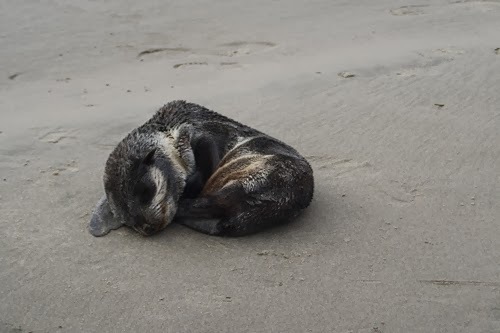 Apparently it was just a tired young fur seal.